Did you know that February 23 is a holiday officially known as Play Tennis Day? The occasion is meant to inspire us humans to pick up a racket and hit the court, but it seems like cats are also very much fans of the sport. Check out these five funny videos of cats playing their own version of tennis to celebrate Play Tennis Day! First up, let’s salute this fine feline sports player. Notice how our Tuxedo champ crouches down below the net at the start of the game? This crucial move adds an element of surprise to his tactics against the plucky human. Naturally, the cat’s athleticism means there’s only one winner in this showdown. Tennis can be a great sport for spectators, especially if those watching the game happen to be seven fluffed-up kittens. Marvel at how they follow the ball in adorable unison! Are they really following a tennis ball, or is a human waving a yummy treat around behind the camera? We’ll never know. Scottish tennis star Andy Murray announced himself on the big time tennis scene by beating Novak Djokovic at the 2012 US Open final. But it wasn’t just human tennis fans who were rooting for Murray. Watch these Bengals playing along to every shot! 4. Cats On Center Court! There’s nothing like a surprise guest to perk up a tennis match. Check out this cocksure ginger kitty who decided to strut on court and interrupt play at a Women’s Tennis Association event in Qatar back in 2018! Just like most sports and hobbies, dedicated practice can really up your game. If you need inspiration, check out the case of Pixie Bob, a 14-year-old feline who gets up and works on his tennis return technique every single day of the year. According to the cat’s owner, he developed an interest in playing the sport of tennis after becoming obsessed with watching games on television. 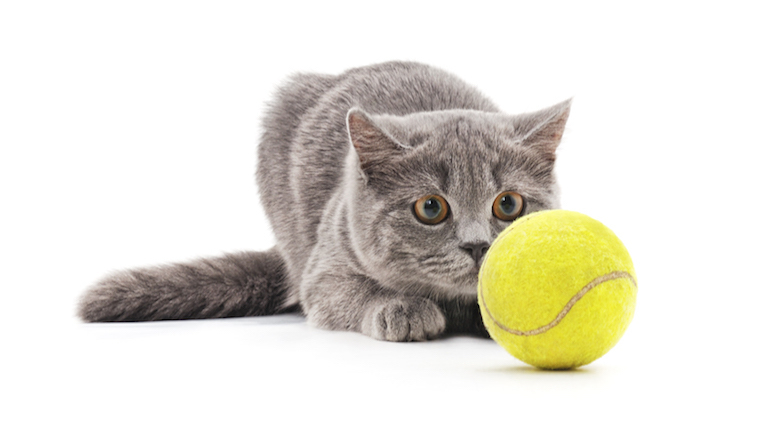 Does your own cat like to play tennis? Tell us all about it in the comments section below!